Add some pep to your step this spring with a fabulous new pair of shoes. In this post I have rounded up the season’s hottest styles that won’t break the bank. While there are many styles here, a few popular styles are the espadrilles and platform wedges. One of my favorite shoe brands is Soludos. They are a perfect choice for the warmer weather. 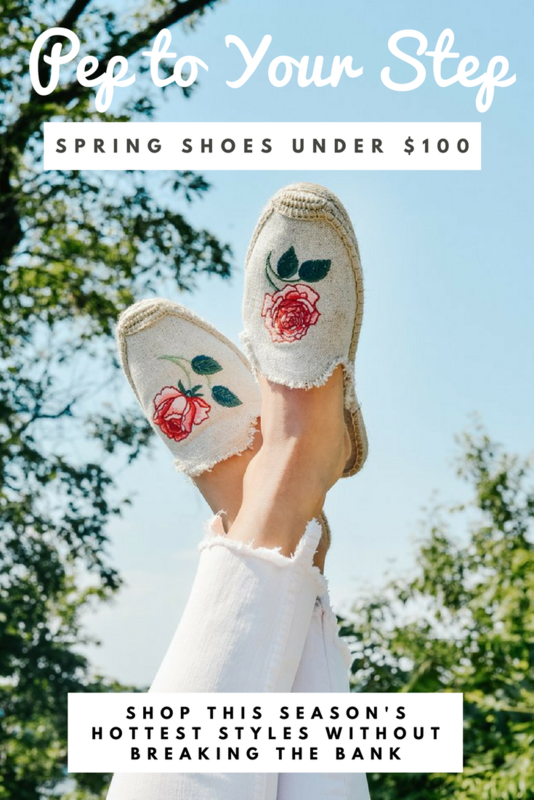 Soludos has revolutionized the espadrilles and have so many cute styles with such cute stitching. I love these cactus ones, flamingos, lemons, and floral embroidery. Whether you’re just shopping around, looking for sartorial inspiration, or ready to check out your cart, I hope this post gives you inspiration on the many different styles for spring. Do you have a favorite find here? Let me know in the comments! These are all so cute! My favorite is the pink laser cut booties, totally need those for Spring! These are all so cute! Espadrilles and wedges are my favorite right now. I just ordered a pair of Soludos and I can’t wait to get them! Great picks! I love the perforated booties! I just can’t wait to get some spring into my wardrobe, great selection! I think shoes for spring are probably some of my favorites of any season! I love the ones you chose, so much gorgeous detailing! I love shoes!!! Especially for spring. Anything blush is right up my alley.